"Now, any keyboardist can take advantage of the computer and iOS integration and superb Motif sound that distinguish the MX line," said Nate Tschetter, marketing manager, Music Production, Yamaha. Yamaha today showcased the MX88, the latest addition to its popular MX line of synthesizers for stage and studio. 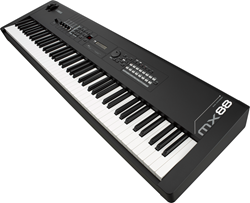 Equipped with 88 weighted keys, the MX88 represents the logical extension of the MX line, known for its high-quality instrument and synth sounds, deep computer and iOS integration, and with this introduction, a full-size keyboard featuring realistic piano action. Connection to both Windows and Mac computers is a breeze, thanks to a class-compliant, bi-directional USB audio/MIDI interface. Players can record the keyboard's superb internal sounds into a computer-based DAW and monitor the computer's output through the keyboard's ¼" audio outputs or headphone jack. "The MX88 will appeal to players who need the touch and feel of a real piano with 88 weighted-action keys," said Nate Tschetter, product marketing manager, Music Production, Yamaha Corporation of America. "Now, any keyboardist can take advantage of the computer and iOS integration and superb Motif sound that distinguish the MX line in the market. And like the MX49/61 BK/BU, MX88 unlocks FM Essential - a free FM synthesizer iOS app. This provides the great sounds inside MX88 along with the pure FM synthesis Yamaha made famous." The MX88 is currently available at authorized Yamaha piano retailers, with an MSRP of $1,299.00.